Owing to our well-equipped manufacturing unit, we have been able to manufacture and supply a superior quality range of Industrial Cyclones. The high-grade raw material is procured from the reliable vendors of the market to manufacture these cyclones in compliance with the set industry standards. All the dust particles are driven towards the envelop surface where they are screwed down with the help of tangential inlet, which allows a flow rotating movement to the gas. The concept of the LV Cyclone is a design with the inlet pulled as far away from the outlet tube as possible. The roof spirals downwards to avoid re-introducing circulated gases into the new gases entering the cyclone. The unique body design further ensures an effective separation of gas and material. As a result a high cycolne efficiency combined with a low cyclone pressure loss is achieved. The LV Cyclone is applied for raw mills, Various cement mills and preheaters. The inlet has been pulled as far away as possible from the cyclone portion. 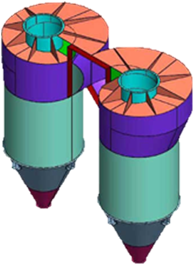 The conventional cylindrical portion of the cyclone has been substituted by a reverse conical portion. The top roof spirals downwards. The inner tube is extended.